A wonderful weekend of Japanese Woodblock Printing at Edinburgh Printmakers with Paul Furneaux. The process is quite in depth and there was so much to take in that I hope my summary of the process does justice to workshop. The studio space is light airy and cathedral in size. While we are woodblock printing another group are screen printing. It's a buzzy focused morning. Paul takes us through the process of dampening the newsprint first as it needs to sit and soak up the water for at least 15 minutes before laying the paper in between the sheets. Once the paper is laid between the newsprint, it is left in plastic on the side for two hours minimum. Next, Paul shows us how to prepare the paper for registration. He shows us two methods. The second one is a revelation and my favourite. The first method takes quite a bit longer. The registration is made on the actual block so if you have a few blocks each block will need this registration process. It almost takes as long as the carving of the print and also uses twice as much wood - hence is used mostly for larger editions. The second method uses a separate L shaped piece of wood which sits up next to the block to line up the paper. Then removed for printing. I am looking forward to making one of these when I get back to the studio. To line up the paper correctly, Paul uses a set square to even up the corners of the paper, then marks each corner with a pencil. He then loads up the paper in between the newsprint (too much newsprint will keep the paper damp for too long. Paul demonstrates the different qualities of sized paper and unsized paper. It is much easier to buy sized paper from companies in the UK but you can get some really good quality unsized paper from Japan. It's bit of a minefield once you start trying to source Japanese papers. The fibres in the papers are much longer therefore much stronger and can absorb much more water based ink than the Western papers. Paul gives us a good idea of what kind of wood to use for carving. His favourite is Shina plywood but again it's a minefield when sourcing the wood as the quality is very changeable. Even when you buy it from the same company, the next batch you buy could be very different to the one before. Today we're going to be using small blocks of plywood. The wood needs to be dampened before printing to stop the ink completely absorbed by the wood. The first prints may not be as good as the wood needs to build up moisture. Paul is using watercolour and gouache paint. He shows us the different effects you can get by mixing the paint with nori paste for a more even colour and just straightforward paint with water for a more mottled softer effect. The amount of water and ink you use, the dampness of the paper, the type of paper, the dampness of the wood, the type of wood, how much pressure you put on the baren, the type of baren, the quality of the brush mark, the type of brush, make a huge difference to the quality of the print. Getting the right balance is quite an art and science. Paul uses a combination of Japanese brushes and shoe brushes for brushing the ink onto the wood. We are shown how to create a bokashi effect -by loading up the colour along the top of the block then using a small brush back and forth slowly bring the brush down creating a gradient effect. It sounds simple enough but again getting the right pressure and speed and moisture is what makes or breaks the effect. He explains the many possibilities when printing with watercolour. You can re-print the same colour over the same area again and again and create a deeper richer colour. You can get transparence effects and tonal effects by printing different colours on top of each other, strong, bold bright colours to delicate, soft colours and much more. With so many options there is so much to learn ' A journey not to be taken lightly!' says Paul. I know this is true when I have seen the extremely fine carved detail and the magnificent layers of colours in well known prints by the likes of Hiroshige and Hokusai's designs. A great tip from Paul was to colour and sand the block before carving. I hadn't thought of this while carving the netsuke so it was another revelation. I could immediately see the benefits of being able to see where you had carved the block. It may sound ridiculous that I hadn't thought of it and it reminds me of the time my mum tried on my grandma's glasses. She cried out 'I've been living in a haze!' She couldn't believe how clear everything was. She had been walking around for years not realising she had blurred vision. Sometimes the simplest solutions are the most difficult to see. 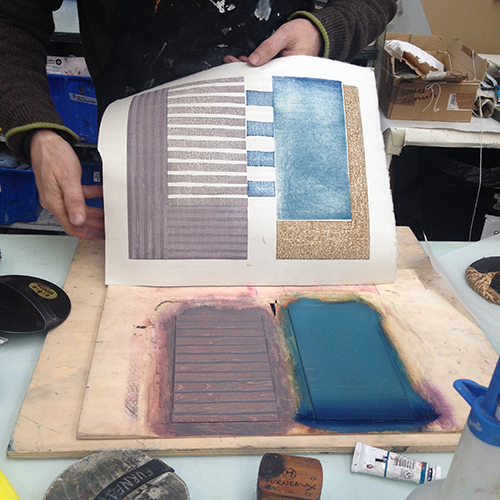 Sanding the block with very fine sandpaper brings up the grain and creates a smooth surface on which to print. After another soak, sand and dry the print is ready for carving. The image has been traced on to tracing paper. Paul shows us how to use carbon paper between the tracing and the block to transfer the image to the block ready to carve. I note another important discovery while watching Paul carving the block. I realise I've been making the first cut too shallow and the second cut too close to the first which is why I've sometimes had to re-carve the same lines. Also watching Paul cut the block and seeing the ease of which he carves reminds me of the aches and pains I get in my elbows when I carve. He explains that keeping the arm steady in one place with the hangito knife upright rather than use too much pressure may help. Also moving the block instead of the wrist. He has not noticed aches and pains when he carves so I really need to to keep an eye on my posture and how I hold the knife if I want the process to be pain free. There are many different knifes and gouges for woodblock carving but Paul explains that the hangito knife and the large gouge tools are the most used tools for Japanese woodblock carving. The V tool is so difficult to sharpen that it is mainly used for small decorative cuts and not for major outlines or key blocks. Also the hangito knife is more precise and much easier to sharpen. Paul gives us a sharpening demo using a gouge tool on a water stone. After lunch we start on our own designs. I have brought many sketches that are much too complicated for a two day printing workshop. I pick out the simplest one - a line drawing I made of some boats and houses. I am eager to print and find myself rushing the tracing onto the block which will now make it difficult to line up the rest of the blocks. I show Paul my traced image on the block. He recognises my urge to print and advises making a reduction print using just this block. A reduction print means to gradually carve away the image in between prints eventually cutting away most of the image. There are pros and cons to this - you can never re-print the image but the registration of the block will be more precise. Also it means you don't have to trace the same image on lots of blocks but at the end of the printing session you don't get to keep the image on the block. So it's a challenge for me as I love the quality of the carved block and like to keep all the blocks from the prints I make. I'm going to be printing this image on two pieces of proofing paper and two pieces of quality handmade Japanese paper. Here we go..